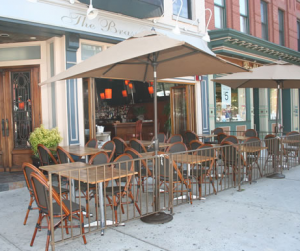 On New Year’s Eve, Saturday, December 31st, the Brass Rail, the Hoboken, New Jersey landmark, will present its popular annual gala dinner following regular dinner seatings between 5:00 p.m. and 7:00 p.m. The gala dinner will feature a three-course prix fixe celebration by executive chef Douglas Gough from 9:00 p.m. – closing. Plus, a Champagne toast to ring 2012. The dinner is priced at $70.00 per person with the option to upgrade to open bar for an additional $40.00 per person (plus tax, additional beverages & gratuity). If you wish to party exclusively at the bar, the premium open bar from 9:00 p.m. – closing includes 2 hours of hot and cold food platters and is priced at $80.00 per person. On New Year’s Day from 11:00 a.m. – 3:00 p.m., “The Rail” will offer a two-course prix fixe brunch, with or without the “hair of the dog.” The brunch is priced at $17.00 per person; $27.00 per person if you desire a choice of Mimosas, Bloody Marys, Red Sangria, or featured beer. For more information, please call (201) 659-7074.